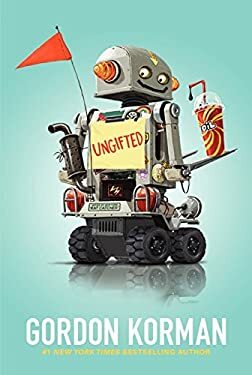 From #1 New York Times bestselling author Gordon Korman comes a hilarious and heartfelt novel in which one middle-school troublemaker accidentally moves into the gifted and talented program and changes everything. For fans of Louis Sachar and Jack Gantos, this funny and touching underdog story is a lovable and goofy adventure with robot fights, middle-school dances, live experiments, and statue-toppling pranks When Donovan Curtis pulls a major prank at his middle school, he thinks he s finally gone too far. But thanks to a mix-up by one of the administrators, instead of getting in trouble, Donovan is sent to the Academy of Scholastic Distinction, a special program for gifted and talented students.Although it wasn t exactly what Donovan had intended, the ASD couldn t be a more perfectly unexpected hideout for someone like him. But as the students and teachers of ASD grow to realize that Donovan may not be good at math or science (or just about anything), he shows that his gifts may be exactly what the ASD students never knew they needed." New (164 available) BRAND NEW. Over 1.5 million happy customers. 100% money-back guarantee. Make your purchase count: support Better World Books' worldwide literacy partners.